CLIC Sargent is the UK’s leading cancer charity for children, young people and their families, providing clinical, practical, financial and emotional support to help them cope with cancer. September is Childhood Cancer Awareness Month in the UK and CLIC Sargent is using this month to raise awareness of the impact of childhood cancer as well as their work in providing support. During this month they are asking people to wear a gold ribbon to show their support for these families. 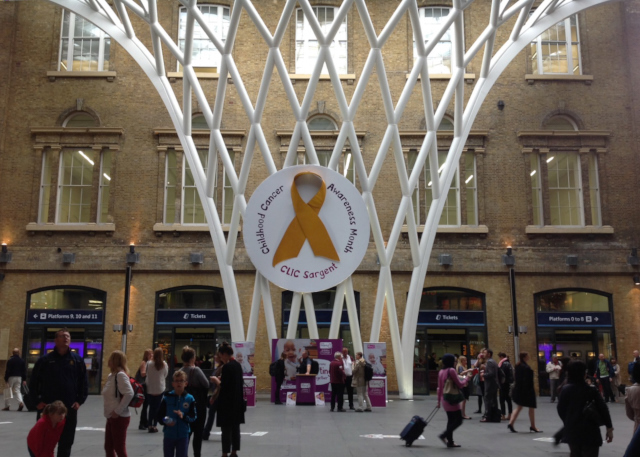 We were delighted to help CLIC Sargent when they recently asked if we could make a large banner with three dimensional gold ribbon for the western concourse at Kings Cross Station to highlight their work and Childhood Cancer Awareness Month. You can buy your gold ribbon from CLIC Sargent’s online or charity shops, at branches of Lidl, Wallis or JD Wetherspoon pubs.